Set in Gaul, at the time of the Roman occupation, Norma is the story of a virgin druid priestess who falls in love with a Roman, leading her to break her vows and betray her faith. Although they have two sons together and Norma is continually threatened by death if anyone should find out her secret, Pollione, the Roman pro-consul, has decided he does not love her anymore. Instead, another of the virgin priestesses, Adalgisa, has caught his eye. Adalgisa is initially reluctant to break her vows, but when offered the opportunity to follow Pollione to Rome and live there as his wife she goes to Norma for help, asking to be released from her commitment. Seeing a reflection of her own relationship in Adalgisa’s description of hers, Norma releases her, not knowing that the Roman she is talking about is Pollione. When she finds out, Norma is enraged and swears to have vengeance against him. Alone with her children, Norma is torn between her maternal love for her sons, and a desire to release them from a future of disgrace and shame by murdering them in their sleep. She spares them, and instead asks Adalgisa to take them to Rome and to raise them as her own. Adalgisa tries to talk to Pollione, to remind him of his love for Norma, but his only response is that he will take her to Rome whether she wants to go or not. Norma swears vengeance on all of Rome and readies her people, who have been thirsting for vengeance for some time. Pollione is found in the sacred forest, profaning the temple. The druids call for him to be sacrificed and Norma agrees, but her love for him stops her hand. Instead, she offers herself as sacrifice, asking her father, Oroveso, to care for her children. Pollione sees Norma’s true spirit in this act and joins her on the pyre, so that they may be together eternally. 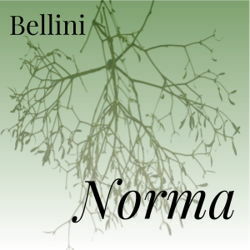 With some of opera’s most famous arias, Bellini’s Norma is a work of true bel canto beauty, that will remain a favorite in the operatic canon for years to come. Gaul, Roman Occupation, 50 B.C.